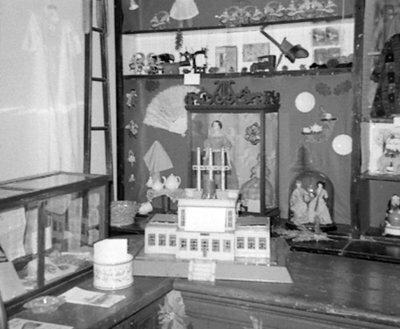 A black and white photograph of a Christmas toy display at the Whitby Museum. The Whitby Historical Society was founded in 1967 and is a Not for Profit Organization that is made up of volunteers. It owns a collection of artifacts representing Whitby's history. Christmas Toy Display, January 1969, Brian Winter. Whitby Archives A2013_004_289A.